2015. Men's stripped collared shirt woven into seven weavings. Silk cross-stitch embroidery. Each 8 x 10 inches. Detail. 2015. Men's stripped collared shirt woven into seven weavings. Silk cross-stitch embroidery. Each 8 x 10 inches. 2018, Deconstructed menswear striped shirts, wood pallets, thirteen 22x24 inch panels. Title refers to a phrase from the old testament, “thou shalt not wear garments of two materials,” (Leviticus 19 V.19) which, poorly translated in the 10th century to “two colors,” led to the creation of striped prisoner uniforms, right up until the Holocaust. A textile with a legacy of violence. Detail, 2018, Deconstructed menswear striped shirts, wood pallets, thirteen 22x24 inch panels. 2016, Cotton, thread made from spun paper with written text (title,) dye, 8 x 9 inches. 2016, silk and handmade Japanese (Washi) paper, 17x 25 inches. 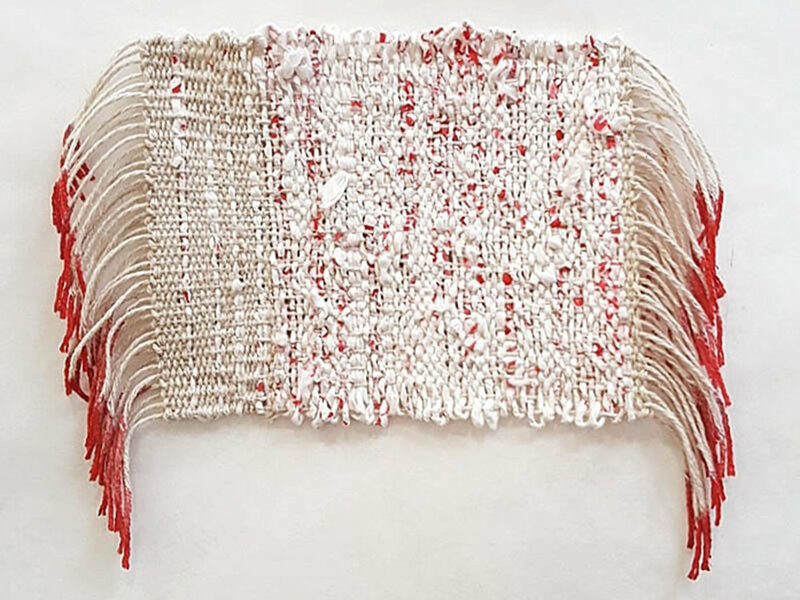 2016, Silk, thread made from spun paper with written text (title,) 7 x 5 inches. 2013, extension of Come Closer. 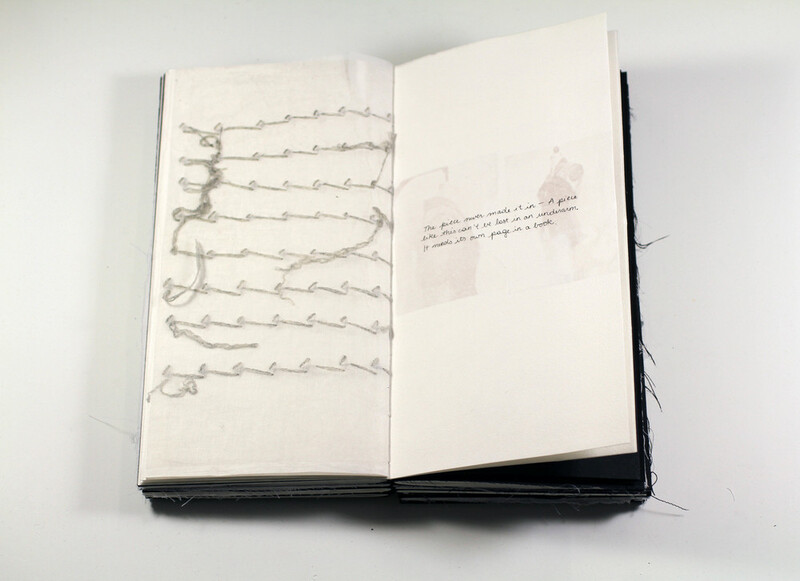 Artist book representing garments and processes involved in creating the soft sculptures. 28 x 15 x 8cm. Mixed media, etchings, textiles, embroidery, print transfers. 2017, Tibetan wool, translated text written on spun paper, 18 x 22 inches each. French nationalism translated to Nepali and vice-versa using google translate, written and spun into 2 weavings.